In the environment that we are used to, matter occurs predominantly in the solid, liquid or gaseous phase. However in the universe at large, the situation is quite different. Most of the matter in the universe exists as Dark Matter or as Dark Energy and we know very little about it yet. The small fraction of visible matter exists predominantly either as hot dense plasma in the interior of stars or in stellar atmospheres, or as hot plasma of very low density in interstellar space. Therefore plasma is viewed as the fourth state of matter, following the idea that as heat is added to a solid, it undergoes a phase transition to a liquid. If more heat is added the phase transition to a gas occurs. The addition of still more energy leads to a regime, where the thermal energy of the atoms or molecules forming the gas is so large, that the electrostatic forces which ordinarily bind the electrons to the atomic nucleus are overcome. The system then consists of a mixture of electrically charged particles like ions and electrons and neutral particles as well. In this situation, the long-range Coulomb force is the factor that determines the statistical properties of the sample. Plasmas occur naturally only as a transient phenomenon in lightning or in the aurora. The practical application of man made plasmas is very extensive and ranges from material modification, surface cleaning, and micro fabrication of electronic components to the future prospects of energy production in fusion plasmas. Only very little is known about the bulk properties of matter in high energy density states. It is therefore an interesting field with promising applications to astrophysics, plasma physics and material sciences. As soon as we will be able to investigate high energy density samples under reproducible conditions in the laboratory with high repetition rate, we can expect a rapid progress in this field. Traditional methods to generate high energy density (HED) states are based on dynamic shock compression. Chemical explosions, high current Z-pinches, high power lasers and in a few cases even nuclear explosions were used to expose matter to high pressure up to the Gbar regime. As a consequence the investigated sample undergoes a number of phase transitions during the experiment. The present state of experimental and theoretical research in the field is demonstrated in Fig. 1 on an example of the HED thermodynamic data for lead. The equation-of-state (EOS) surface shown in the figure is calculated using a semi-empirical model. Most of the experimental EOS data for high temperature, high pressure states is available only for a narrow region along the Hugoniot curves (shock adiabats, H). The EOS data obtained in static diamond-anvil-cell (DAC) experiments extends up to a few Mbar pressures but is limited to rather low temperatures. For most of the metals, only rough theoretical estimates of the critical point parameters are available. 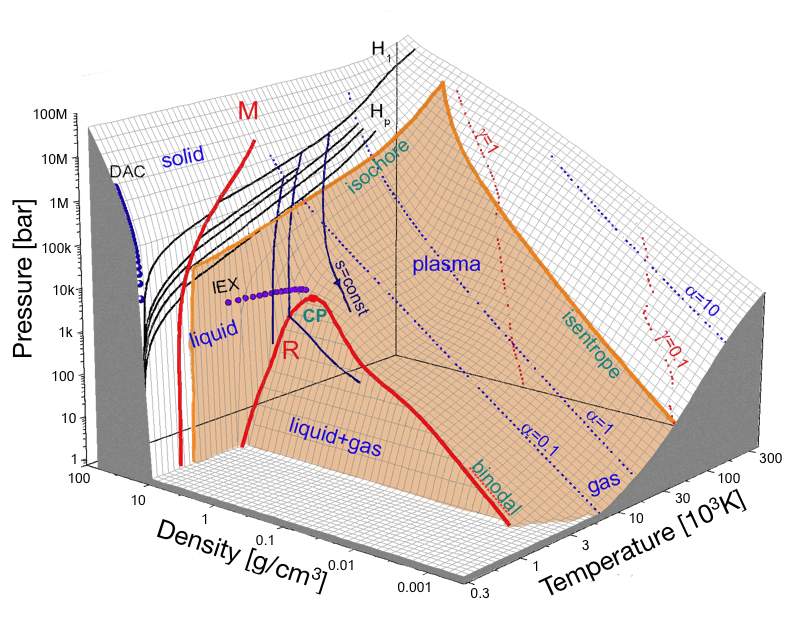 A broad area of the phase diagram below the the shock adiabates including the critical point region, states of expanded hot liquid and strongly coupled plasma as well as warm dense matter region is still unexplored experimentally. This is exactly the area which is accessible in the experiments using the intense heavy ion beams at GSI and at FAIR. Exploding lead foil after isochoric heating with an intense heavy ion beam. Movie was taken at the HHT experimental area in december 2006. Intense heavy ion beams open a new pathway to address this research experimentally. The unique energy deposition characteristics of heavy ion beams assure that macroscopic volumes are heated fast and in a very homogeneous way, such that temperature gradients as well as density gradients are very low compared to other methods. Due to their high kinetic energy, fast heavy ions penetrate deep into the volume of the target where they deposit the energy along the ion trajectories. This interaction mechanism constitutes an effective volume heating of the sample with low gradients, as long as ion range is large compared to the target dimension. In an accelerator experiment the particle number and the particle energy are well determined. Thus the total beam pulse energy is known with high precision. The spatial and time dependent energy deposition profile inside the target volume can be derived from the intensity distribution during the beam pulse and the radial intensity distribution of the beam focus. Ion beam induced high energy density states are therefore characterized by a precise knowledge of the initial conditions, which no other method can give in this way. It is very important to note that the statistical significance of the data will only be limited by the maximum target exchange frequency. 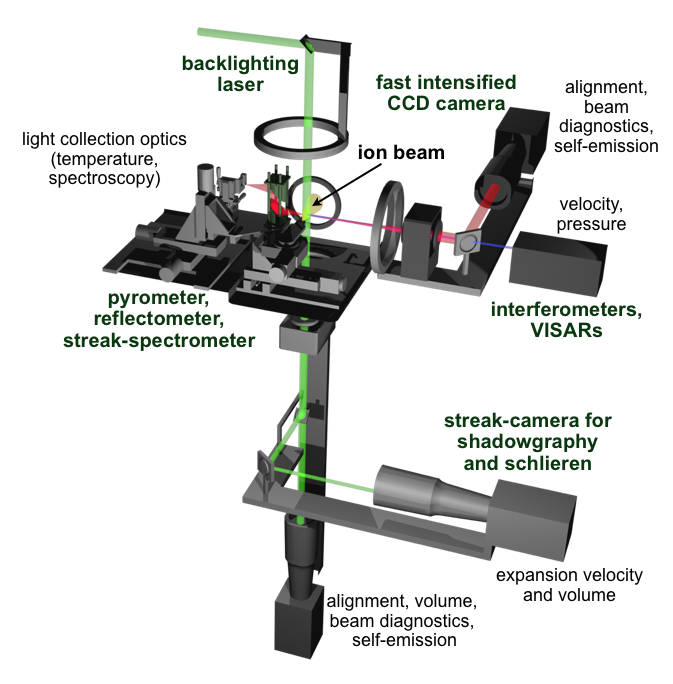 This allows a large number of single shot experiments which is also difficult to achieve with other methods. Obtaining new data on thermophysical, optical and transport properties of various materials in HED/WDM states with strong inter-particle interaction, including near boiling curve, two-phase liquid-gas and the critical point regions. A typical scheme of such experiments is shown in Fig. 2.